Today, Love Saves the World welcomes Joyce Proell who is currently on tour for her historical romance novel, Eliza. Joyce will be awarding a $10 Amazon or BN.com gift card to a randomly drawn commenter during the tour. Click here to visit her other stops. Since I am hosting Joyce on the last day of 2012, I thought I'd ask her what her plans were for 2013. I’m delighted to be here today, this very last day of 2012. As one year comes to an end and another year begins, it seems fortuitous that I should be asked to write about five things I plan to do in 2013. I believe in goals. They keep me organized, headed in a direction I want to go and accountable. So thanks for asking this important question. It requires me to think, to plan and to commit. Finish WIP: For those unfamiliar with this term, WIP stands for work in progress. My current project, loosely titled, Amaryllis, has me perplexed, befuddled and stuck in the dreadful middle of the story. I just shake my head, wondering how to yank it out of the murky doldrums. It’s already over one hundred thousand words, and I still have to write the big love scene! But I am determined, more than anything else, to finish this story and to weep with happiness when the last scene is written. Wish me luck. Launch Book: My second book, A Burning Truth, is scheduled for release in July, 2013 from Champagne Books. This if the first of a trilogy of romantic suspense stories set in 1882. In the months leading up to publication, I will be busy with edits and promotions. Travel: Just so you don’t get the impression all is work for me…well, I do like to have a little fun. I love to travel and visit family and friends who live hither and yon. Already I have trips scheduled to Florida, California, Chicago, New Orleans and Savannah. I hope to get in one more long vacation, maybe to Europe. But believe me, when I travel, I play. Exercise: Since I write, usually every day, I sit a lot. When I’m not writing, I often read. More sitting. So, to be fair to my body, it seems only smart and kind that I should get some exercise, too. So rather than walk five days a week, which is my current routine, I will commit to some form of exercise, seven days a week. That’s right everybody. You heard it here first! Appreciate: This is the most important goal to me. In 2013, I will make a conscious choice to appreciate all the wonderful people and opportunities offered to me. Each person in my life is a precious gift and will be cherished. I intend to appreciate each day as if it is a new and wonderful adventure. It’s a wonderful exercise to plan out one’s year. It only takes a few minutes. I hope you take the time to think about your plans. What would you like to see happen in 2013? A husband who wants you dead is the greatest motivation for change. 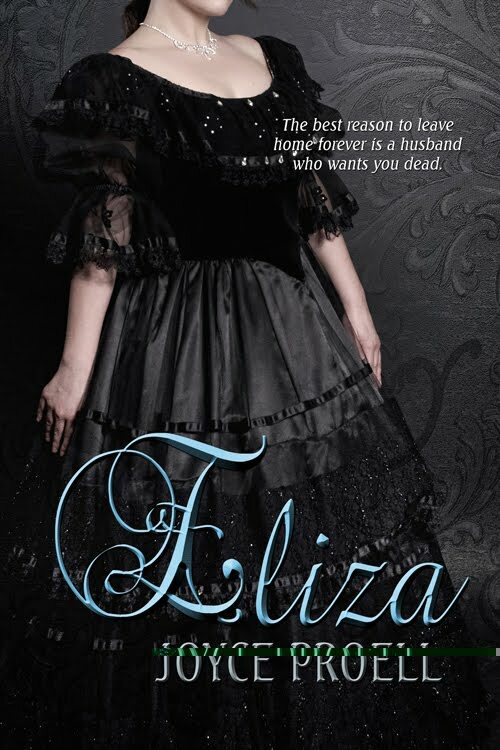 Posing as a widow, strong-willed Eliza Danton flees her marriage determined to bury the past and live a solitary life. Traveling by riverboat to the Minnesota frontier, her flight turns perilous when forces threaten to expose her deception. With problems mounting and her trust shattered, she is forced draw upon her only resource, a man whose captivating presence rocks the very foundation of her well laid plans. But love flourishes even in the toughest of times and when you least expect it. Attorney and contented loner, Will Heaton hides his tender heart behind an elusive facade. Grief is nothing new to him having lost a wife and child. But when a pretty widow thrusts a baby into his arms, he’s hooked. When he sees Eliza harassed by the same man he believes killed his wife, Will grabs at the chance to redress past mistakes and vows to keep her safe. Why is this happening? She’d never encouraged him. But perhaps she hadn’t discouraged him either. As guilt nibbled away at her she knew she had to put an end to this fruitless pursuit. “Listen to me. I won’t marry again.” She slapped each word into the air with a distinct pop, pop, pop. He reared back as if her words proved a glancing blow. He stiffened and she flicked an apprehensive look at Karl’s powerful hands. Would he slap her or use his fists on her like Abe used to do? His departing footsteps pounded on the wooden deck and thudded loudly on the stairs as he went below. Eliza stood there, too astounded and alarmed to move. After a time, she glanced at the moon, hoping it might have some curative power to quell her rioting nerves. To her disappointment, the golden disc streaked by wisps of gnarled clouds offered no answers or comfort. Suddenly, all the anger and frustration inside exploded. She kicked out. Her foot smashed into a deck chair with an earsplitting thwack. The chair arced then slammed and scuttled noisily against the planks. “Make yourself known, please,” she snapped. Will Heaton stepped out from behind the big potted palms near the pilothouse and jolted her clear through. He’d seen everything! The kissing, the intimacy. Heard her lies. Oh, God. She wanted to sink right into the river. A muscle quirked in his cheek. Her mouth gripped so tight she couldn’t talk. She glared at him expecting the intensity of her anger to light up the sky. Her body trembled as she waited for him to break the silence. When he did, it left her stunned. I laughed when my husband suggested I write a book. Me? What did I know about writing? Yet the notion held possibility, so I hatched a plan. A year later, I sent off my first completed manuscript and promptly received a score of polite rejections. Bruised but undaunted, I forged ahead, new plan in hand. Later, armed with the knowledge acquired from writing classes, seminars and the help of fellow writers, I finished my second story. Eliza is that story. I grew up in Minnesota. In college, I studied psychology and earned a master’s degree in Social Work. After living in Chicago, Minneapolis, Portland and Reno, my husband and I make our home only miles from where I grew up. I worked in the field of mental health as a psychiatric social worker, administrator and later settled into private practice. Retired at a reasonably young age, I write full time. 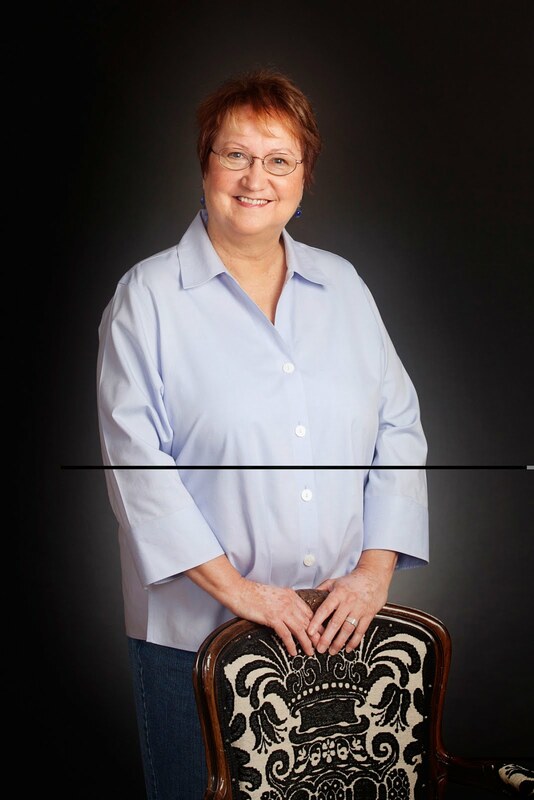 I’m an avid reader, a foodie and cook, a crossword puzzle fanatic and a daily walker. 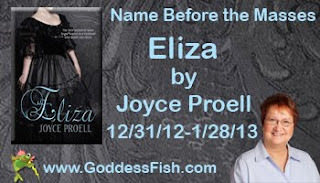 Joyce will be awarding a $10 Amazon or BN.com gift card to a randomly drawn commenter during the tour. Click here to visit her other stops. Thanks again for inviting me today. I will be in the car all day--road trip, alas, but I will check in with you later. I already plant to buy this book. I am excited to know that you are writing more in this time slot. Love to read about early days. I want to lose some weight-- and this time, I'm doing it for ME! :-) Good luck with your goals! I love your goal to travel in 2013. You have some great places picked out already. Thank you, Joyce and GoddessFish for the opportunity! Thank you, everybody, for stopping by and helping me welcome Joyce and her book! Happy New Year! Have a great first day of 2013! It's New Year's Eve. Hope all of you have a fantastic year in 2013. After eight hours in the car, a dinner at the Texas Roadhouse, I am back in my hotel. Tomorrow Florida. Good luck with any New Year's goals. Joyce, you sound as though you have the determination and creativity to solve the problem you're having with your current WIP. I'm sure it will fall into place eventually and we'll be reading another book as enjoyable as Eliza! Joyce it sounds like you are going to be very busy in 2013. Thanks folks for all the encouraging comments. Thanks for the excerpt -- it's always fascinating to see what piece an author will choose!